Hundreds of thousands of people lined the streets of Paris on Saturday to bid farewell to the French rock star Johnny Hallyday, who died this week at the age of 74 after a battle with lung cancer. His coffin was driven in a cortege down the Champs-Elysees followed by hundreds of leather-clad bikers. President Emmanuel Macron paid tribute to the singer in a eulogy at the Madeleine church. Paris was brought to a standstill by the ceremony, which was broadcast live. As the cortege carrying his coffin left the funeral home in the Paris suburb of Nanterre, some 700 bikers took to the Champs-Elysees. Hallyday's white coffin was driven slowly from the Arc de Triomphe along the famous avenue as emotional fans cheered and wept. During the service, members of his band performed instrumental versions of his songs outside at the Madeleine church as the crowds sang along. Fans began to gather in the city overnight in anticipation of the country's "national homage" to the singer as giant screens were erected to show footage of the man known as the "French Elvis". National television and radio have put out a stream of special programmes since his death on Wednesday, with Hallyday's best-known songs being played along with recordings of tributes from friends and fans. 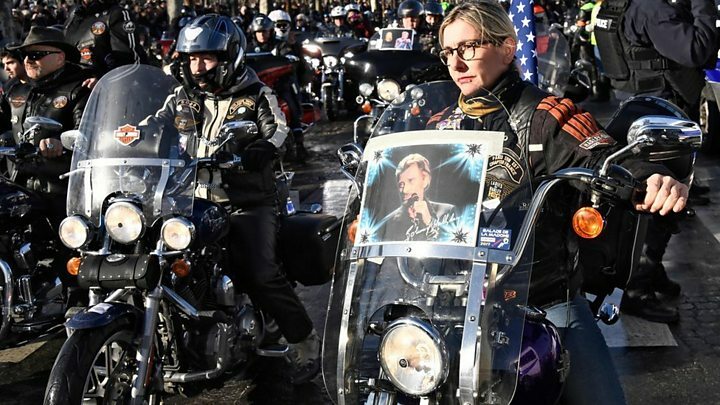 Mr Macron approved Saturday's ceremony along with Hallyday's widow Laeticia amid a popular clamour for a national homage. The French president said the singer had touched everyone's lives: "In each of your lives there have been moments where one of his songs translated what you had in your heart, what we have in our hearts. "A love story, a loss, a moment of defiance, the birth of a child, pain - in his voice, in his songs, in his face." As Mr Macron addressed the large crowd gathered at the church, many of whom were in tears, they chanted: "Johnny, Johnny, Johnny Hallyday." Some of the musician's fans have demanded that a monument be built in recognition of his achievements. Others have expressed disappointment at news that Hallyday is likely to be buried on the French Caribbean island of St Barts, where he had his home. One fan, Francois Le Lay, told AFP news agency: "We would have preferred if he was buried in Paris, but if Johnny wanted that, we will respect it. "My wife and I will put the money aside that we would have spent going to his concerts so we can fly to Saint Barts one day." On Friday, the Eiffel Tower was lit up with the words "Merci Johnny". At the famous L'Olympia music venue in Paris where Hallyday once enjoyed a three-week residency to mark 40 years in show business, the singer's name was displayed as a tribute. The star, whose real name was Jean-Philippe Smet, sold more than 110 million records and starred in a number of films, including one directed by Jean-Luc Godard. He once performed before a million people in a mobile musical cavalcade down the Champs-Elysees. However despite 6,000 fans chartering flights from Paris to see him play Las Vegas in 1996, he failed to crack the American or any other English-speaking market. The singer, who was once condemned as the rock 'n' roll "corrupter of youth", was often referred to as "the French Elvis" by critics.